Introduction: Chronic periodontitis is a multifactorial disease resulting in the inflammation and destruction of the supporting structures around the teeth, leading to tooth mobility and subsequent loss of tooth. Metabolic disorders, such as diabetes mellitus, play a crucial role in the progression of periodontal inflammatory conditions. Alkaline phosphatase (ALP) enzyme plays a key role in gingival inflammation and bone resorption. Hence, the aim of the present study is to compare the serum and salivary alkaline phosphatase levels in chronic periodontitis patients with or without type-2 diabetes mellitus. Materials and Methods: A total of 45 individuals were included in the study and divided into three groups: Group I (healthy individual), Group II (Chronic periodontitis without diabetes mellitus type-2) and Group III (Chronic periodontitis with type-2 diabetes mellitus) on the basis of clinical, radiographic and blood sugar examination. 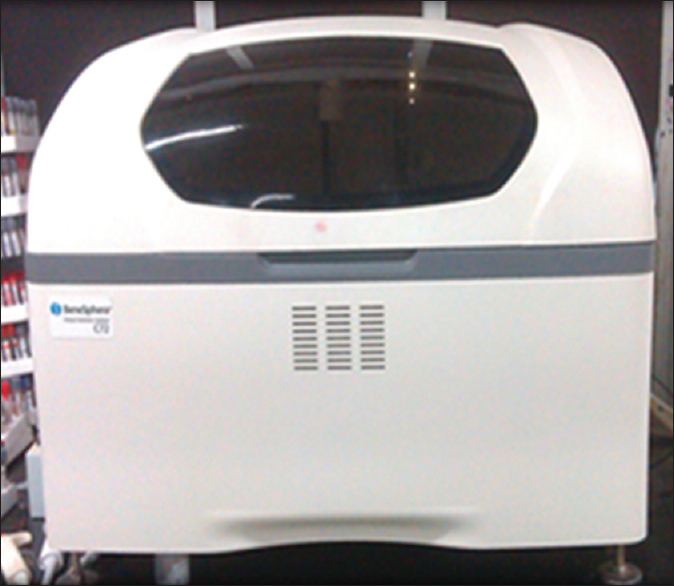 The serum and unstimulated saliva were collected from all patients in aseptic condition and samples were analyzed for alkaline phosphatase level using AVANTOR™ Benesphera ALP Kit by fully automated analyzer. Results: The result showed that the concentration of serum and salivary alkaline phosphatase increases significantly in patients with chronic periodontitis with type-2 diabetes mellitus than chronic periodontitis without diabetes mellitus and healthy patients. Conclusion: We can conclude that alkaline phosphatase can be used as a key inflammatory diagnostic biomarker in periodontal diseases. Group 3: Patients with chronic periodontitis co affected by diabetes mellitus. 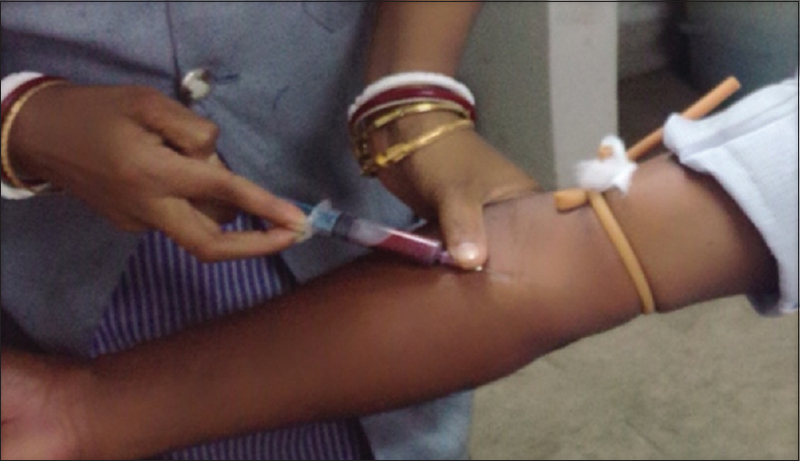 After taking informed written consent, 5 ml of blood was collected from the antecubital vein by venipuncture using 20G needle and immediately transferred to the laboratory [Figure 1]. 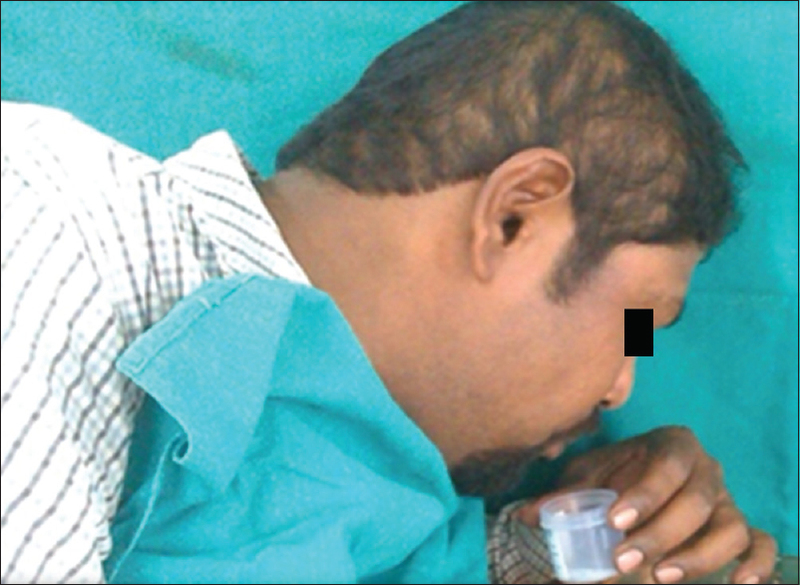 Then, 1 ml of unstimulated whole saliva sample was collected in a sterile disposable plastic container [Figure 2]. Patients were instructed not to brush or eat 8 h before collection of the samples. No dental examination and treatment were carried out 48 h before saliva collection. 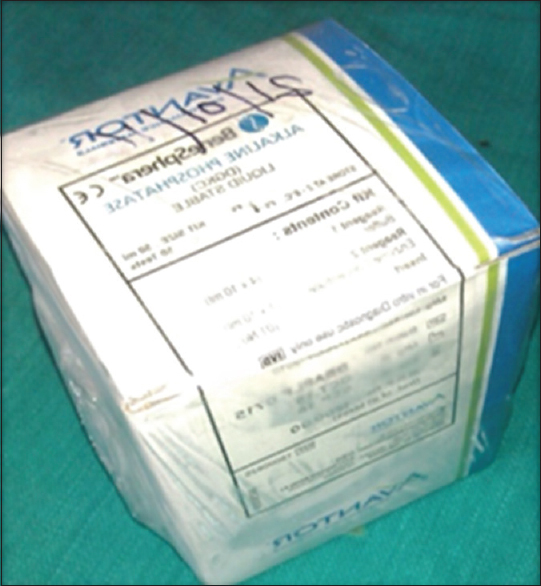 Samples were stored at 4°C and sent to the Department of Biochemistry, ICARE Institute of Medical Sciences and Research. 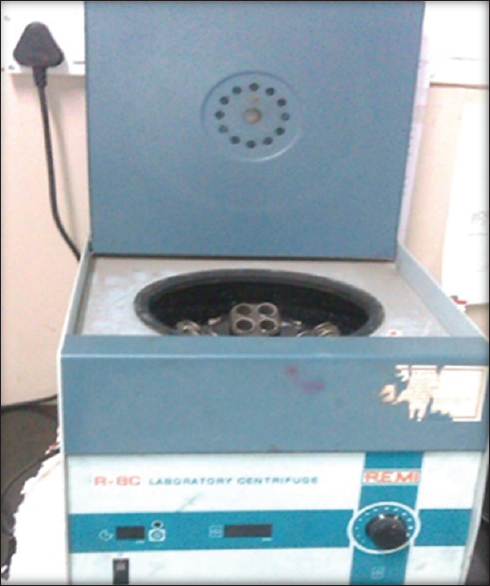 The blood samples were centrifuged at 3000 rpm for 5 min [Figure 3]. The serum was separated from blood. Then whole saliva samples were centrifuged. 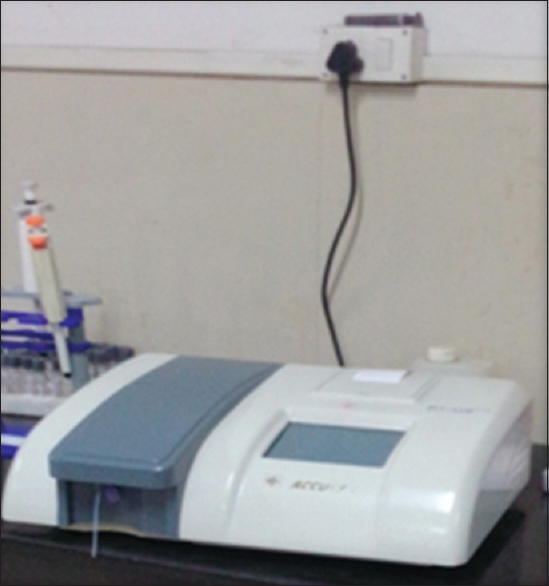 All serum samples were subjected to Auto Analyzer (BeneSphera) for analysis [Figure 4], and all saliva samples were sent to Semi Autoanalyzer [Figure 5]. 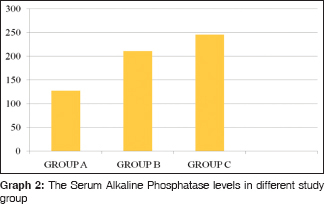 Human AVANTOR Benesphera alkaline phosphatase (ALP) Kit [Figure 6] was used to estimate the alkaline phosphatase concentration in saliva and serum. 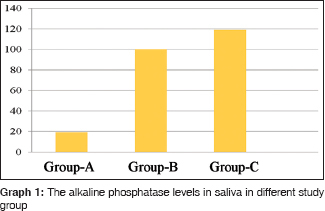 Quantitative analysis revealed salivary alkaline phosphatase levels to be 18.9647 ± 4.3301, 100.0907 ± 18.2945, 119.0767 ± 20.8691 (mean value ± standard deviation) in Groups 1, 2 and 3, respectively. The groups statistically differed from each other (P < 0.05). Results revealed that salivary alkaline phosphatase levels exhibit significantly higher concentration in chronic periodontitis patients and highest in chronic periodontitis patients with type II diabetes mellitus patients than the healthy periodontium group [Table 1], [Table 2], [Table 3] and [Graph 1]. Serum alkaline phosphatase levels were found to be 127.4820 ± 15.5674, 211.2833 ± 27.1612, 245.3047 ± 31.8110 (mean value ± standard deviation), respectively. The groups statistically differed from each other (P < 0.05). Results show that the serum alkaline phosphatase levels exhibit significantly higher in chronic periodontitis patients and highest in chronic periodontitis patients with type II diabetes mellitus patients than the healthy periodontium group [Table 4], [Table 5], [Table 6] and [Graph 2]. Anil S, Baiju FM Current research in diagnostic methods for assessing periodontal disease. Indian J Dent Res. 1998;9:120-3. Mandel ID: Markers of periodontal disease susceptibility and activity derived from saliva. In johnson NW: Risk Markers of Oral Disease 1991;3:228-53. Kaufman E, Lamster IB. Analysis of saliva for periodontal diagnosis – A review. J Clin Periodontol 2000;27:453-65. Shaheen A, Khattak S, Khattak AM, Kamal A, Jaffari SA, Sher A. Serum alkaline phosphatase level in patients with type 2 diabetes mellitus and its relation with periodontitis. KUST Med J 2009;1:51-4. Moss DW. Release of membrane bound enzymes from cells and the generation of isoforms. Clin Chem Acta 1994;226:131-42. Renggli HH: Phagocytosis and killing by cervicular neutrophils. In Lehner T, editor. Periodontal disease and diabetes mellitus. New York, Grune and Stratton; 1977. Safkon-Seppala B, Ainamo J. Periodontal condition in insulin dependent diabetes mellitus. J Clinical periodontal 1992;19:24-9. Loe H, Silness J. Periodontal disease in pregnancy. I Prevalence and severity, Acta Odont Scand 1963;21:533-51. Emrich LJ, Shlossman M, Genco RJ. Periodontal disease in non-insulin dependent diabetes mellitus.J Periodontal 1991;62:123-31. Mochida Y, Duarte WR, Ranzawa H, Paschalis EP, Yamauchi M, Decorin modulates matrix mineralization in vitro. Biochem Biophys Res Commun 2003; 305:6-9. Armitag G. Diagnostic tests for periodontal diseases. J Curr Opinion Dent 1992;2:53. Kumar R, Sharma G. Salivary Alkaline Phosphatase level as diagnostic marker for periodontal disease. JIOH 2011;3;5. Nakamura M. Slots J. Salivary enzymes origin and relationship to periodontal disease. J Peridontol Res 1983;18:559-69. Ishikawa I, Cimasoni G. Alkaline phosphatase in human gingival fluid and its relation to periodontitis. Arch Oral Biol 1970;15:1401-4.